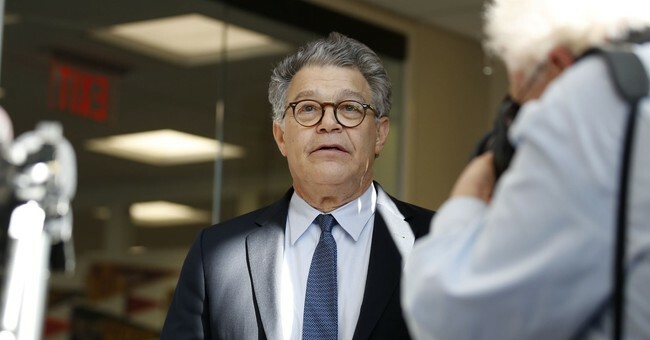 Sen. Al Franken (D-MN) faced accusations from two more women Wednesday, following initial allegations from radio anchor Leeann Tweeden who released photographic evidence that he groped her while she was asleep. Franken also faced many other sexual misconduct accusations from women who say he grabbed them inappropriately while taking photos. Tina Dupuy, a writer and former Congressional staffer, accused Franken Wednesday of groping her while they posed for a photo at a Media Matters party. It happened at a Media Matters party during the first Obama inauguration. It was a great time to be a Democrat. Not only had we just elected the first African American president of the United States, but Franken’s race had triggered a recount, leaving lefties giddy that we would soon have a supermajority in the Senate. This was my first inauguration. I’d never been in the proverbial room where it happens. My experience with government at that point was being a ward of the court in foster care. Noting that I had an interest in politics and in grandstanding—at 14, I ran a scorched-earth campaign to make the entire group home I lived in recycle—my foster dad set up an internship for me at the district office of Representative George Miller. The summer before my senior year of high school, as an intern, I answered calls, thumbed through the congressional record and misalphabetized his constituent files. It was a great experience and, at the time, the closest I’d been to power. D.C. was decked out and packed in for the inauguration of a young and popular new president. The town was buzzing with optimism, and one of the many events on our list was a swanky Media Matters party with Democratic notables everywhere. Then I saw Al Franken. I only bug celebrities for pictures when it’ll make my foster mom happy. She loves Franken, so I asked to get a picture with him. We posed for the shot. He immediately put his hand on my waist, grabbing a handful of flesh. I froze. Then he squeezed. At least twice. I’d been married for two years at the time; I don’t let my husband touch me like that in public because I believe it diminishes me as a professional woman. Al Franken’s familiarity was inappropriate and unwanted. It was also quick; he knew exactly what he was doing. It shrunk me. It’s like I was no longer a person, only ornamental. It said, “You don’t matter—and I do.” He wanted to cop a feel and he demonstrated he didn’t need my permission. Dupuy’s account follows an account from an anonymous Democratic congressional aide who told Politico Wednesday morning that Franken tried to forcibly kiss her after a radio show taping in 2006 telling her it was his right as an entertainer. “This allegation is categorically not true and the idea that I would claim this as my right as an entertainer is preposterous. I look forward to fully cooperating with the ongoing ethics committee investigation,” Franken said in a statement to POLITICO. Franken did issued a lengthy apology for the incident with radio anchor Leeann Tweeden, specifically addressing the photo she released showing Franken groping her while she slept. However, Franken was a bit vaguer in response to allegations of groping from multiple women who say he took advantage of photo opportunities to grab them from behind. Franken has yet to respond to Dupuy’s claims. Roughly two dozen Democrats called for Franken’s resignation Wednesday following the seventh accuser’s account. He is scheduled to make an announcement Thursday that some expect to be his resignation.